One word – YUMMY! 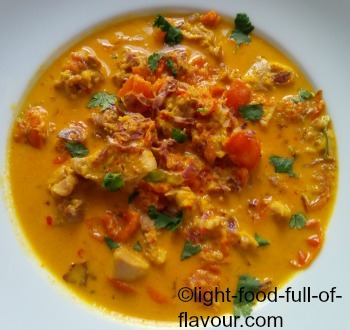 I love this chicken curry with lemongrass and tomatoes. Apart from all the lovely flavours, it is also healthy. Tomatoes are healthier when cooked – a rarity among vegetables – and I also add finely shredded Brussels sprouts to this curry. 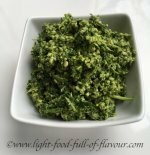 Brussels sprouts may be an unusual vegetable to add to a curry but I think they are a perfect addition as they have a strong, somewhat peppery taste. I managed to get hold of purple-sprouting Brussels sprouts this time, but I also use the green ones. They are super-healthy. Brussels sprouts are part of the family of cruciferous vegetables – which also include broccoli, cabbage, kale, cauliflower and cress – and contain anti-cancer and liver-friendly nutrients. Cruciferous vegetables are best eaten raw or just lightly cooked. I only add the shredded Brussels sprouts during the last two minutes of cooking – leaving them still crunchy and with a fair amount of their nutrients still intact. You can swap the sprouts for some spinach or some sliced sugar snaps – again only adding them at the last couple of minutes of cooking. I am using boneless and skinless chicken thighs. If you want to use chicken breast instead, be careful not to dry out the meat. If you can’t get hold of lemongrass, use finely grated zest of an un-waxed lime or lemon instead. 1. Place the coconut oil, shallots, garlic, ginger, lemongrass, chopped chilli, and coriander stalks in a food processor and pulse to a rough paste. 2. Place all of the paste in a pan over a medium-high heat. Add the turmeric and black pepper to the pan and fry - stirring continuously - for 5 minutes. Add the tomatoes and continue to fry for a further 5 minutes. 3. Add the coconut milk, honey and fish sauce to the pot, stir and bring to a simmer. Add the chicken pieces, stir and allow the curry to simmer for about 20 minutes – give the curry a stir every now and then - until the chicken is cooked through. If using, add the shredded Brussels sprouts during the two last minutes of cooking. 4. Once ready, take the pan off the heat and stir in the lime juice and coriander (cilantro) leaves. I serve this chicken curry with lemongrass with either quinoa or brown basmati rice.